In an important development, the Odisha government is coming up with a new amendment to the Odisha Scheduled Areas Transfer of Immovable Property (by Scheduled Tribes) regulations, 1956, which seeks to undermine the fifth schedule of the Indian constitution. The fifth schedule gives special rights to tribals over natural resources, including land, in tribal areas. The amendment, if pushed through, will be the first of its kind in India where the fifth scheduled tribal area land will be easily alienation to non-tribals. The land will be allowed to be sold to a mining company or a corporate house. The implications are grave: The amendment, if passed, will prompt other states too to follow the Odisha “model”. It points towards how their means of livelihood for survival (forest) were taken away or destroyed by the nearby project areas. 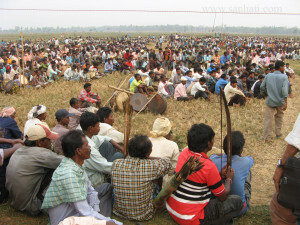 The fifth schedule, however, sought to protect and regulate the tribal land and other natural resources. Even then, “different mechanisms” were adopted to take away the tribals’ private land in order to alienate them. “At present the private land of tribals (agricultural land) is less than one percent but population statistic of scheduled tribe is 23 percent within Odisha”, it adds. It advocates that the proposed amendment is also contravenes the provisions of the Panchayat (Extension to Scheduled Areas) Act (or PESA), 1996, which activates the firth schedule. It will disturb peace and good governance in scheduled areas will be disturbed as per fifth schedule. “Transfer of tribal land should not be allowed through any means (bank) to non-tribal, which contradicts the decision of Apex Court of India vide P. Rama Reddy & others”, it says. Sent to the President via the district collector, Sundargarh, Odisha, and handed over at Rourkela, a a copy of the representation has also been sent to the ministry of tribal affairs, Government of India, National Commission of Scheduled Tribe, ministry of home affairs, Governmment of India, and the ministry of law and Justice, Government of India.